Intel® Solid-State Drive Data Center Family for PCIe* (Intel® SSD DC Family for PCIe*) provides breakthrough performance to modernize data center storage from an industry leader. The Intel® SSD Data Center Family for PCIe* brings extreme data throughput directly to Intel® Xeon® processors with up to six times faster data transfer speed ...than 6 Gbps SAS/SATA SSDs. The Intel® SSD Data Center Family for PCIe* is capable of reading data up to 2.8 GB/s and 460k Input/Output Operations Per Second (IOPS) and writing up to 1.9 GB/s and 180k IOPS. The performance of a single drive from the Intel® SSD Data Center Family for PCIe*, specifically the Intel® SSD DC P3700 Series (460K IOPS), can replace the performance of 7 SATA SSDs aggregated through an HBA (~500K IOPS). At 200 IOPS per Hard Disk Drive (HDD), 2,300 15K HDDs would be needed to match the performance of one Intel® SSD Data Center Family for PCIe* device. The consistently amazing of the Intel® SSD Data Center Family for PCIe* provides fast, unwavering data streams directly to Intel® Xeon® processors making server data transfers efficient. 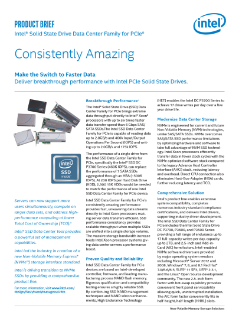 SSD performance consistency provides scalable throughput when multiple SSDs are unified into a single storage volume. The massive storage bandwidth increase feeds Intel® Xeon® processor-based systems giving data center servers a performance boost. Servers can now support more users simultaneously, compute on larger data sets, and address high performance computing (HPC) at lower Total Cost of Ownership (TCO). A demo of a 64-node, 368 Terabyte Virtual SAN* powered by Intel® SSDs. Intel® SSD NVMe* changes everything, delivering near real-time access to data while reducing costs and saving energy.